Fresh off a much needed win last night, the Reds face the Brewers tonight in the second of the current 3 game series at Miller Park in Milwaukee. Game time will once again be 7:40pm EDT.Ã‚Â Hopefully your personal sports world is a much happier place thanks to the Reds ending up on the good side of score Monday night. I know mine is. Whether this win may signal the start of a true positive turn in the Reds fate or simply be an outlier in a season off to a historically poor start only time will tell. For now, exhale, relax and enjoy how good it felt to see the Reds hitters beating up on opposing pitchers for a change. Sal Romano makes his fourth start of the season for Reds tonight. The big right hander has struggled early on in all his starts to date. In his first start of the season Romano managed to steady himself and make it through 6 innings with 3 earned runs allowed to post a marginal quality start. He has not been as fortunate in is two succeeding efforts, allowing 4 earned runs in 5 inning his second time to the mound followed by 4 earned runs in just 4.1 innings in his most recent start (a scoring change announced Monday resulted in Romano be charged with 4 rather than 3 earned runs in his start April 12). Romano is walking batters at a 5.28 per 9 innings rate and is giving up home runs at a 1.76 per 9 innings rate, a volatile combination. It would behoove Romano to show signs immediately of correcting these issues if he wishes to hold onto his rotation spot over the long haul.Ã‚Â You can check out Matt WilkesÃ‚Â deeper look at Romano here. Right hander Junior Guerra gets the start for the Brewers. Guerra is a 33 year old journeyman pitcher who bounced through several other organizations, nearly all at the minor league level, before landing with the Brewers organization in 2016. In 2016 he made 20 MLB starts while splitting time between AAA and MLB.Ã‚Â Last year Guerra pitched mostly at MLB for the Brewers making 21 appearances, 14 of which were starts but working only 70.1 total innings. He started 2018 in AAA but was subsequently promoted to fill a rotation vacancy. Guerra appears to be a personification of an organizational depth player. Perhaps the only thing more brutal than Romano’s 12.5% BB rate is that it is ~3% higher than his strikeout rate. Luis CastilloÃ‚Â came up an out short of 7 full innings Monday.Ã‚Â Thus the Reds pen was tasked to cover 2.1 innings.Ã‚Â Kevin Quackenbush pitched 0.1 of an inning. Wandy Peralta and Raisel Iglesias each covered an inning.Ã‚Â All three should be good for at least an inning again tonight. Unfortunately first man out of the pen Cody Reed faced a single batter, threw a run allowing wild pitch, allowed a hit and thus probably saw his stock sink even more. The good news is that Jesse Winker returns to the Reds lineup. The not as good news is that he is not leading off; but, on the other hand having Winker and Votto hitting back to back isn’t a bad idea either. The curious use of Devin Mesoraco continues. After sitting last night versus a left hander, he starts tonight against a rightie. And alas,Ã‚Â Alex Blandino sits again.Ã‚Â Just as an aside, if Eugenio Suarez and Nick Senzel were added to this lineup. it would be starting to look like a formidable lineup. 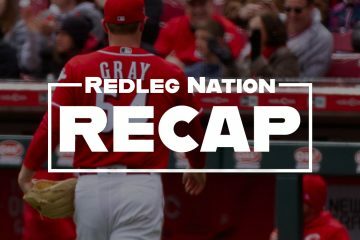 On the other side, the Reds dodge Christian Yelich for another game; but, Braun and Thames returning ratchets up the pressureÃ‚Â on Romano to avoid walks and keep the ball in the park. 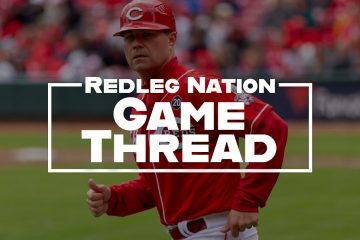 You want news about home runs in the Reds minor league system? Doug Gray has it. It is a pretty safe bet you already knew the RedsÃ‚Â are not in the top 20 of MLB.com’s power rankings; but, they’ve probably contributed to the placement the several teams that are. Bernie Brewer will wear holes in his lederhosen tonight. I have yet to see where anyone has claimed A. Hernandez. On another note Oakland has DFA ‘ed Trayce Thompson. Why not take a look at him? Takes a 40 man roster spot if they claim him on waivers. If he clears A’s can simply outright him to minors. If Sal has a difficult outing he may hear Stephenson’s footsteps. If anything it’s nice to have some depth at AAA. Some times it seems like the only luck BobSteve has is bad (not that he couldn’t help himself more) because on the heels of his big game last Wednesday, the Bats have had their entire series in Buffalo snowed out with BobSteve’s turn up. Tomorrow is already cancelled. Thursday is an off day; so, he won’t pitch again till Friday, a 9 day or so break. Why do I have a bad feeling that Winker is going to hit .245 with three doubles and two homeruns in the next 4 months, then go on the DL, then have shoulder surgery just as spring training gets underway, and then we’re going to get lots of stories about how he played hurt all year? It’s just history and the somewhat odd way they’ve managed this injury that has me on edge. Is that paranoid of me? That feeling comes from the last several years of watching the Reds’ injuries pile up; like Kremcheck saying Votto would be fine in a couple of weeks, followed by 2 (I think) surgeries on his knee. On that Luckhaupt tweet, the comment below mentioned Romano has never had a winning record in any season of professional baseball. Now while W-L isn’t a metric we get caught up in around here, I did go to FanGraphs and look at Romano’s history. And, more than never having a winning record, I saw that Romano is like Reed and Mahle….all 3 moved quickly to the Reds after some promise in AA, with either little or no time in AAA. -how thin the talent pipeline for the Reds is, at the moment. The next wave of prospects is mostly 2 to 3 years out. So, when Suarez and Schebler is out, capable replacements are few. And it shows in production and game results. I hope we see Blandino, Ervin and Peraza get extended looks, including at the expense of Duvall’s playing time. If those guys can’t make it, the near-term alternative is signing more Penningtons, Gosselins….more “guys” whose best days are behind them. I personally don’t buy in that Wins are a totally meaningless stat where starters are concerned because they have to have completed at least 5 innings and left with their team in the lead to be awarded the “W”. Good pitchers can be penalized by poor offense, defense or bullpen work behind them. Occasionally a “bad” effort may get rewarded for an undeserved starter’s W bailed out by a big offensive effort behind them. But I don’t believe these situations totally devalue W’s as a measurement of a starting pitcher. It is just another stat to weigh and evaluate. True. Mario Soto could have had so many more wins the offense behind him was weak. I was glad to see Cueto get 20. He deserved it, and it’s a touchstone for starters. It means nothing for relievers, and a positive win total is sometimes a negative for them, blowing a lead and then the home team bats bail them out. I still look for W-L, just as an instant read on a SP, but, boy, it’s getting harder to find. ESPN tucks it in now, on the second level of a player’s stat page. The biggest change to me is how managers view W-L. Our old friend, Davey Johnson, was well-known in MLB for wanting to go out and get a guy before the pitcher blew up and lost his chance at a win. Now, everywhere on MLBTV, it feels managers are balancing pitching count and innings completed, trying to get a guy to finish 6 or 7 innings, with less regard to it being a W or a L for the SP. Yeah it can be like a level 1 triage stat for a guy you know is a starter particularly if you have knowledge of the team pitches for. I doubt we’ll ever see Blandino, Ervin, or Peraza have the kind of offensive season that Duvall had in either 2016 or 2017. Throw in the fact that Duvall has been Gold Glove finalist 2 years in a row & it’s highly unlikely that Ervin, Blandino, Peraza,( & throw in Winker) have 2 Gold Glove finalists’ seasons among them & expensing Duvall’s playing time becomes ludicrous. Adam Duvall is in his age 30 season. His WAR went from 2.6 in 2016 to 1.7 in 2017. He has faded badly in the second half of both seasons. The odds of him being any more than a bench player for the Next Good Reds Team are very slim. Duvall was shopped to other teams in the off-season. He is still here, blocking Winker, whose arm, by accounts I have read, isn’t superior enough for RF. Given all that, I can’t think of another rebuilding team who would play Duvall in front of Winker, or even Ervin, for that matter. When Schebler gets back, Duvall should literally be 5th choice, minimum, every single day, since Ol’ Havoc is going to get his ABs, for sure. But, who knows, with this club. Please cite those “rebuilding ” teams that bench producing veterans in favor of giving playing time to unproven prospects. by the way, averaging 30 HR & 100 RBI is producing. A saw it in a Tweet yesterday. An error charged to Peraza was changed to a hit. I believe the batter was Fowler. The box score on MLB.com had been updated today but I didn’t see any sort of annotation indicating it had been changed or why. Thanks. I’d have to go back and check, but the only error I remember on Peraza was one of those balls where he went out to short CF. I think one dropped and one that Hamilton could have caught clanked off Peraza’s glove instead. By the by, does anyone besides blood commenters call him Ã¢â‚¬Å“BobSteveÃ¢â‚¬Â? Not one press release or reporter ever call him that. Do you think if it were a good nickname, or one he liked, it wouldÃ¢â‚¬â„¢ve stuck by now. I call him BobSteve because it is easier to type. I’ll check into it and maybe cease. BTW I think my body of work here pretty clearly demonstrates I happen to be very much in his corner for the most part. Barring injury, I believe he will eventually be an above average starter for somebody in MLB. Yeah, Jim, and remember, it’s George Anderson, the heck with this Sparky stuff. And I was hoping Ryan Gennett was going to get a hit there …. Watch your tongue, Vegas. Or David Dewitt Bailey will throw one high and tight at you. Yelich was activated, so I wonder if he will be available as a pinch hitter. Front Row Amy is back tonight after sitting last night out. THOM! is also a terrible judge/communicator of how well a fly ball is hit. Thames or Braun for the home run pool tonight? Whoa, Thames made an out? Good 1st inning for Romano! Jim, SalRom is looking good, eh? I like seeing Romano mix in more breaking porches. That fastball is decent but tends to get him into trouble. Have to agree with Jim. Tucker last night vs a lefty, Mez tonight vs. a righty. WHY? Very tight zone tonight by this ump. Guerra has walked 2 and hit one….so Peraza makes an out on the first pitch. He has to see the fewest pitches per atbat then anyone in mlb? He’s the opposite of Moneyball. He could easily be a .280 or even .300 hitter and still be bad offensively. I believe Peraza’s will develop, but I wouldn’t mind if that last AB got him benched in favor of Poor Blandino tomorrow. I don’t think Peraza will sit at all . They want to see what he has. The only way he sits is if Senzel gets called up. Don’t know why they ever throw Duvall anything other then a slider:( He tries to be patient but he’ll end up chasing that every time. It was predictable when he laid off that first one that he would swing at the second one. And he did. Agree. I snickered a bit when they did. Better them than us. I would rather see Blandino strikeout than a 30 year old journeyman that will be out of the league once he leaves the Reds. VAREDSFAN, not only is Amy at the game tonight. We are getting some really great shots of her when a lefty is batting. By the way, what’s the score.?? No wonder Brewer attendance is so good every year…right? Even though it ended in an out, I think a 10 pitch AB from Billy is pretty good. Price is not going to change, he will keep putting Pennington out there at 3B. Reds GM needs to DFA Pennington, so Price doesn’t have the option of starting Pennington. That will force Price to have to play Blandino. Or Rosell Herrera. He’s killing it at AAA and has a career .347 obp in the minors plus he can run and play anywhere in the OF too. You’d have to DFA Gosselton, too. Never, ever, when it counts. Barnhart in to catch? Mes has been hit by pitches a few times lately. I wonder …. Mez out of the game…any word. HBP maybe? That was … predictable. 2-0 Brewers. That’s what it meant. When it counts, no with a 8-0 game. Explain it more please. An at bat in the 6th inning of a game in April proves some point? My pleasure. The point have been made for some years now, just a group of people blinfolded by stats that donÃ‚Â´t tell the whole picture. Tomorrow for instance, the recap will praise the 2 times he got on base, the holy sacred obp will increase but wonÃ‚Â´t tell how he missed THREE FASTBALLS down the middle to strikeout. Next inning, of course, a FB right in the middle is not missed by Baby Ruth Thames. Result? obp up, Reds down 2-0. Got it? 2 mistakes: 1)blindfolded. 2) strikeout with a ruuner on base and no outs. Votto has a career wRC+ of 192 and a slugging % of 642 in high leverage situations. Definitely not “clutch”. I guess we will just go with your analysis instead of real information. That was an ugly sequence from Romano. Having trouble getting through the Milwaukee lineup a third time. Romano has hit the wall. Good game for Sal to build on. Tough luck. Two in a row? we’ve barely won two at all. Who didnÃ¢â‚¬â„¢t see a Thames HR happening on a 94mph fastball right down the middle. That thing is still waiting to land. The Brewers found Thames in Korea. DW finds the Goose and Pennington for the Reds. Wow thanks! Peraza hits balls where they don’t need a mitt. That ball was moving inside….can he not pickup the movement and take it? By June….he’ll have 1 homer and maybe 2-3 walks. They’ll have to figure out that he can’t play at some point? Geez, a swinging bunt, just in time for Thames. Floro did a good job getting out of that, but my goodness I couldÃ¢â‚¬â„¢ve written a novel that half inning. That last 3 innings of baseball are becoming the last few minutes of basketball – just takes forever. Oh, look! It’s Cody Reed! Gasoline, meet dumpster fire! (Okay, two quick outs while I logged in, so I hope I’m wrong. But I’m still posting it). He did it. Good for him. Left good ol Lyin’ Ryan standing on third. Yep. Very happy to be wrong about that one.